Available at weekends between 12pm and 2.30pm, the new brunch menu features a range of old faithful favourites as well as some more unusual dishes. Any brunch that’s available well into the afternoon gets a big thumbs up from us, and the relaxed, family-friendly atmosphere of the restaurant is also a plus point on sleepy Sundays. On the menu there are a selection of small and large plates, as well as cocktails and smoothies. Choose a selection of smaller plates to share, try one of the bigger plates each, or opt for a two-course brunch if you’ve got a never-ending appetite. There are traditional options like the Eggs Benedict and the full Scottish breakfast, and twists on a classic with dishes like the croissant topped with yogurt, berries and granola. If you want something a little less breakfast-y, try the charcuterie and cheeseboard or the flat iron steak baguette with mustard mayonnaise and caramelised onions, which perfectly bridges the gap between breakfast and lunch. We’d recommend the poached egg with avocado and tomato salsa on rye bread (you can’t go wrong with avocado toast, can you?) or the baked duck egg with potato, truffle and parmesan. The croissant was also a firm favourite of ours, offering a deliciously light option to start the day. Don’t forget to order yourself a breakfast cocktail too. 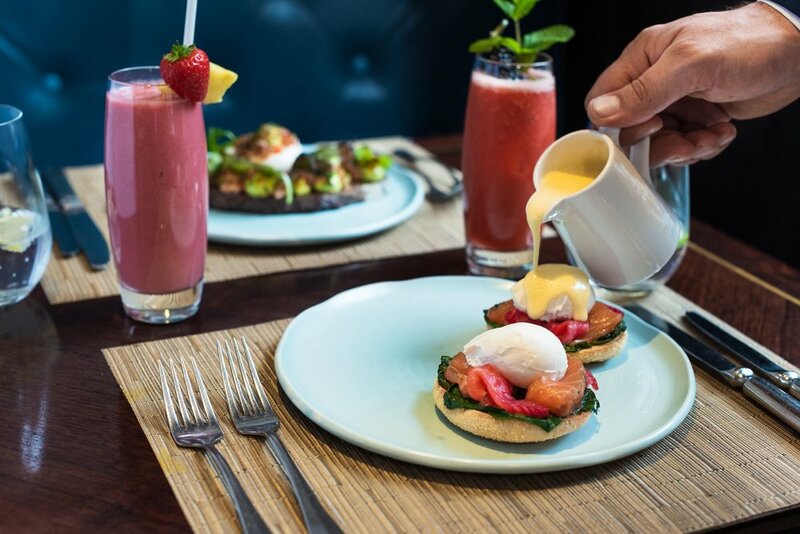 If you’re a Bloody Mary kind of person, you have to try the Galvin Brasserie de Luxe’s signature serve, or opt for a Mimosa if you fancy some fizz. For the kids, there are smoothies made with fresh fruit, with flavours changing every weekend.